if PD is a fail are you going to go Thuban BE? or really dont care about two extra cores? Steamroller, Excavator, DELOREAN TIME MACHINE, USS ENTERPRISE, whatever comes next. it better produce to see me again. Can you still buy Thubans? Edit: Just checked...I guess there are still a few 1045s around. They're not BE though. I was able to get my CPU up to 3.6ghz from 2.8ghz. 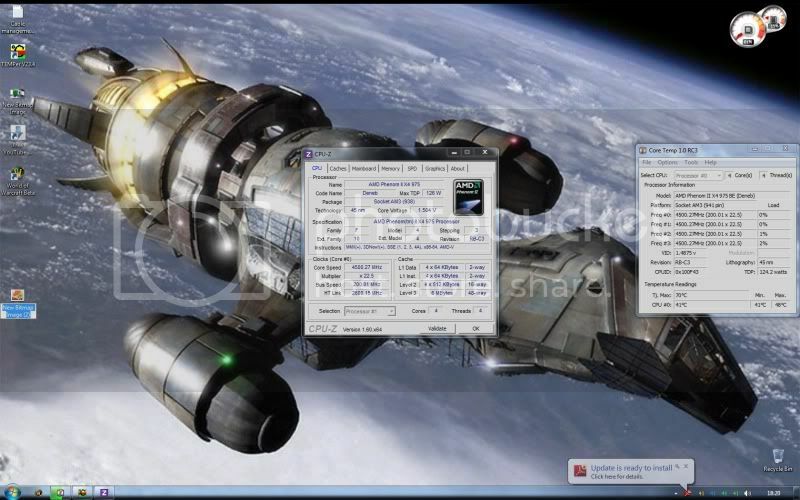 I have been running 3.5ghz which was stable. So at 3.6ghz I ran these stress/benches multiple times: Intel Burn Test,3Dmark 11 and Vantage,Cinebench 11.5 and was using the computer all day with no problems. So I went and did my Prime95 testing. Well on small FFTs which doesnt stress ram it ran fine for over a half hour. So I tried on Blend which tests alot of ram and it failed in less than ten minutes with the 3.6ghz settings. so all of my other benching and stressing worked great. I have seen users declare their OC to be "stable enough"
so I decided the extra 100mhz wasnt worth the time anymore and reset back to 3.5ghz. It might be for well-threaded games that lean heavily on the CPU such as Skyrim...but for the most part, no, it wouldn't really be any better. "This list is for gamers who want to get the most for their money. If you don’t play games, then the CPUs on this list may not be suitable for your particular needs. The criteria to get on this list are strictly price/performance. We acknowledge that there are other factors that come into play, such as platform price or CPU overclockability, but we're not going to complicate things by factoring in motherboard costs. We may add honorable mentions for outstanding products in the future, though. For now, our recommendations are based on stock clock speeds and performance at that price." Well the article was to gauge CPUs from a price vs. performance standpoint, however that chart at the end is strictly based on performance, so you'd have to factor in the price yourself to make that judgement call. Because the 2600K and 2500K are in the same tier of performance but the 2600K costs 50% more, it is obviously much worse for gaming from a value standpoint. Here is a resource to help you judge if a CPU is a reasonable value or not: the gaming CPU hierarchy chart, which groups CPUs with similar overall gaming performance levels into tiers. The top tier contains the highest-performing gaming CPUs available and gaming performance decreases as you go down the tiers from there. @mal: That's why the 4170 is a higher tier than the 8120. Only four cores, but a 35% higher core clock. how does a 1k$ cpu (i7 3960) can manage to be in tier 1 on a price to performance basis (it is no.1 on performance basis but not in p/p)? It needs to be with pentiums. i7 is better series, so they placed i7 at higher position, because they cann't increase the width of chart too much so they have to place i7 at top. 4170 can make sense in 4/5th tier but definately not in 3rd. 970 can beat it in any single threaded tasks, 955 can smoke it away in any multithreaded tasks. So 4170@140$ is a anomaly in tier 3.
when i overclock my cpu then chokes (vrm) gets too hot (so hot that i can't touch them). so the question is , Is it safe? i only have 2x90mm fan. but if i place it directly above vrm system (i don't know ) then it will cause air turbulence in my cabinet and it will blow the hot air from cpu heat sink to vrm. . I knew we had good taste.. Mine have an aluminum heatsink on them, which is connected to the southbridge heatsinks by heat pipes...but, but my board came with it. I did however remove the crappy rubber thermal pad and replace it with arctic MX-2. It should be fine as aluminum is non-magnetic, but I wouldn't recommend using a conductive thermal grease like arctic silver.